A cohort of Australia’s leading fund managers gathered at the 2017 Future Generation Investment Forum two weeks ago, each presenting their top stock idea. A clear trend is already emerging in the domestic stocks mentioned. While the broader market has pulled back 2.2% since the Forum, this group of stocks has gained 3.9% on average. 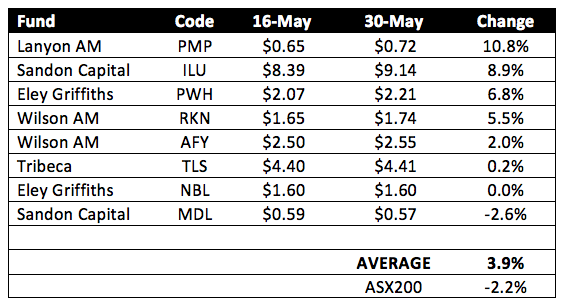 Of the 15 stocks mentioned, the 8 ASX-listed came from Geoff Wilson and Chris Stott of Wilson Asset Management, Ben Griffiths of Eley Griffiths Group, Sean Fenton of Tribeca Investment Partners, Gabriel Radzyminski of Sandon Capital, and David Prescott of Lanyon Asset Management. And while 2 weeks doesn’t quite represent a full investment cycle, it is interesting to note nearly the whole basket significantly bucking the current market trend. In case you missed it, Livewire provided coverage of the event, and you can watch the presentations in their entirety here. Maybe, or is it self-fulfilling? One would assume (hope?) these same managers are still buying their "top stock ideas". Add in their followers and some Livewire readers and that's probably enough buying pressure to keep these stocks rising for a while. Hi Graeme, could be any number of reasons and they could be entirely unrelated to the Future Gen. We just find it interesting to have a look at these things after the fact. We did the same for the Hearts and Minds Conference last year.